The area I am going to describe is located in the southeast corner of Oakland County, known as the Hazel Park School District. The name was given to the area by a real estate company at the time it was bought and subdivided. When it was taken over by sub-dividers 12 years ago it was covered with woods and brush, and was considered a fine hunting ground. It covers four square miles in area and is square in shape. 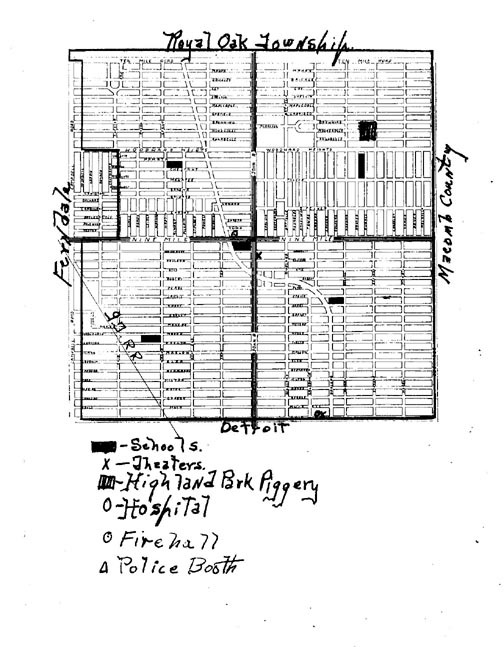 It is bounded on the west by Campbell Road and the City of Ferndale, on the north by Ten Mile Road and school district number nine, an unincorporated area on the east by Dequindre Road and Macomb County, the adjacent area being unincorporated, and on the south by Eight mile Road and the City of Detroit. In June 1923, the population of the area was 1,776. A phenomenal increase has taken place since that time.1 According to the estimate of the Hazel Park Public School’s census list the population was about 14,000 in May 1928. Thirty five hundred are of school age and about 3,100 will enroll in school in September. These people belong to the working class and are not wealthy. Their success depends on the industrial and labor conditions in the City of Detroit as there are no industries in Hazel Park. At one time it was estimated that 75% of the laborers worked at Ford Motor Company. During the time that the Fords factories were closed, some got work elsewhere, but many of them were out of work for several months and conditions were very bad. Some had to give up their homes, which they were buying on the installment plan, and many had to have help from charitable organizations. Fifteen percent of the adults are foreign born, and about 10 percent of the children of school age were born in other countries. Americanization classes are offered each year in night school to help foreign adults prepare for their citizenship examinations. Literature, information and help are given out from the school superintendent’s office. He is a member of the Americanization Committee of Detroit. Approximately 20% of the population is continually drifting so it makes the community unsettled and hard to organize. The general feeling is everybody for himself and let the other fellow go. The housing conditions are bad in some parts of Hazel Park. There are many modern well-kept homes with five or six rooms and quite a large number of modern two family income bungalows. On the other hand there are many garage homes that have only two or three rooms. I have no data so I cannot compute the house congestion but I do know that in many of these small houses, father, mother, and five or six children have to live. It is hard to conceive of the conditions that the school nurses tell about in their report. Running water is not present in all parts of the district so unsanitary conditions do exist. Many houses do not have basements because of inadequate sewers. The land is low and many parts are swampy. Water often stands around or under the houses for several days. There are times each year when it is impossible for people to get in and out of their houses because of water. Often, they have to leave and go live with relatives or friends until the water subsides. The majority of the people who buy lots and build in this section do it because they want to get out of the city and away from high rents. They buy their lots and a little lumber on the installment plan. Along with the help of friends they build their houses nights and Sundays. Contractors build a few houses from time to time and sell them on the installment plan. It is not an attractive place for contractors to build houses because it is difficult to get building or mortgage loans and also because of so many small houses in most of the neighborhoods and the lack of ample fire protection. There are about 15 miles of open ditches in or surrounding Hazel Park. These ditches are from eight to 10 feet wide at the top, narrowing to two to three feet at the bottom and four to six feet in depth. They have been dug because it was thought they would help drain the land and act as outlets for sewers. There is very little fall to them and in the spring, or after a heavy rain, they are full of water. Some of the water gradually goes away but never all of it, and what remains becomes stagnant and full of disease germs and are a menace to health. In the summer, the smell of these ditches can be detected from two or three blocks away. Think of living near such a ditch and having your children playing in or near the polluted water. The City of Highland Park, not having a satisfactory place within its boundaries where garbage could be disposed of, went outside its city limits and even beyond the city limits of Detroit one and one half miles to secure the place. Seven years ago the City purchased several acres of land that is located in the northeast quarter of the four square miles of Hazel Park. They keep from 400-600 hogs at this location where they squeal, sleep, stink and eat. The hogs are fed the garbage that is transported from Highland Park in large trucks. The unpleasant aroma that comes from these yards often penetrates the air many blocks away. It has been declared a menace to public health and a hindrance to building developments, but because of the lack of local incorporation, it seems impossible to compel the owners to move it. Within the last two years Hazel Park has voted on incorporation as a village three times without success. The negative votes won by a small majority at the last vote. One and a half years ago the section voted on annexation to the City of Detroit. It voted itself in, but was turned down by the Detroit voters. At present, there is a petition filed that has been accepted by the Township Board of Supervisors for the area to vote on annexation to the City of Royal Oak on September 4th. Partisan and sectional strife have divided the district into many opposing factions. Some favor annexation to Ferndale and other favor annexation to Royal Oak. Some oppose annexation to any other community, but favor incorporation as a village or as a city; others are content to remain as they are, while others have no opinion on the matter. About 125 stores do the business that is carried on in Hazel Park. Some of the owners are prospering while others are not. Some are like the population in that they come and go. The chain grocery stores do most of the grocery business. As in all new communities there is a real estate office on nearly every other corner along the main streets. Some of the salesmen are making a living and others are not. It is easy to see that the standard of living in this section depends on the labor conditions in Detroit. 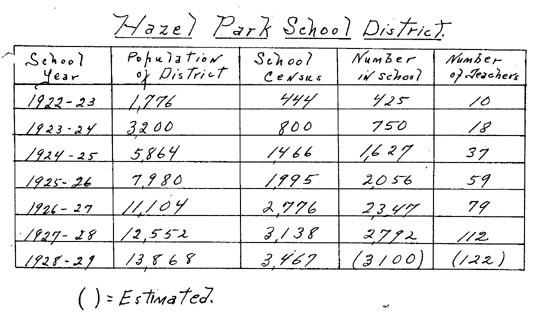 The assessed evaluation of Hazel Park as of July 1, 1927, was $11,762,575.00. This made per capita evaluation of $927.00 at that time. The school tax rate for 1927-28 was $25.75 for each $1,000.00 evaluation, while the total rate was $35.25. The school budget for 1927-28 called for $343,000.00. There are two banks in the section that take care of the ordinary banking needs, but they can only make small loans because of limited resources. There is no form of local government. The governing power is vested in the township and county authorities. The township offices are four miles away at Royal Oak, and the county offices are at Pontiac, 16 miles distant. There are many things that could be done under local government that cannot be done under the present form. It is nearly impossible to get improvements. It is a real job to make progress in a community where there are 14,000 people with no local government, and next to a large city where the community feels the effect of crime as it exists in the city. There are cases that need immediate attention, but by the time they get to the county authorities, they put the offenders on probation and allow them to go free. Stolen automobiles are often found harbored in the district. Blind pigs and all the forms of vice that go with them carry on in various part. There is an endless number of petty robbery causes and very few of the offenders can be caught. There are four deputy sheriffs appointed by the County Sheriff of Pontiac, who has headquarters in a police booth at the main corner of the district. The booth was bought, paid for and moved to the corner by the local Exchange Club. The deputies wore citizen’s clothes until two months ago when they bought new blue uniforms. They are good officers but are subject to calls to other pats of the Township at all times. Sometimes when they are needed very badly in Hazel Park they cannot be found. Fire protection is very inadequate. The Township has a fire hall near the center of the district where it maintains one fire engine, chemical fire extinguishers and the Township’s ambulance. The Fire Department could give better service that it does if there were more hydrants. There are only 15 in the four square miles. If a fire gets a little start, the building usually burns to the ground because of the lack of fire fighting apparatus or the lack of hydrants near the fire’s location. The fire engine is subject to calls outside the four square miles and into other parts of the Township. The lack of fire protection makes the rate of fire insurance very high. The three main highways are paved and there is pavement on the north, west and south boundaries. Some of the cross streets are cindered but in the spring there are many, many streets that cannot be traveled. People have to leave their cars along the main highways and walk to their homes. Two bus lines on John R and Nine Mile Road cover four miles in the district and run over different routes to the Ford factory, where transfer is made to Detroit downtown bus, car and jitney lines. Bus service over these two lines runs every 10 minutes. A streetcar line with 30 minutes service passes diagonally through Hazel Park. The Detroit City bus line runs over Eight Mile Road, the south boundary of the district, where five minute service is maintained. These means of transportation do not serve the district adequately. There are sidewalks along many of the streets, but in most cases they are the ones placed by the smooth-tongued sub-dividers. They were built cheaply and usually are placed lower than the streets, so much of the time they are covered with water. There is no garbage collection. The usual method of disposal is by burying or burning. However, there are many who throw it on the ground, where it creates an ideal place for the development of disease germs that are gladly carried by the files and mosquitoes. There are no parks or recreational centers in Hazel Park except the school grounds that are made available throughout the summer, as well as during the school year. Gymnasium classes for men and women are held with the high school gymnasium during the winter. Through the strenuous and untiring efforts of the local Exchange Club a post office has been located near the main corner. The office has been open about a year. Before that time the people had to go to Ferndale, two miles distant, to mail parcel post packages and there was only one delivery of mail a day. Near the main corner it was delivered to the stores and homes, but for the most part, it was left in rural delivery mail- boxes on the corners. Now we have two home deliveries a day in all parts of the district. The sewer system is inadequate to take care of the needs. Where there are sewers they are small and cannot take care of the regular sewage without the surface water. In many parts there are no sewers and the unsanitary out door toilets have to be used. Many parts of the area do not have running water so the people have to carry it. They often get it two or three blocks away from a well that has not been inspected by health authorities and perhaps it is a menace to health. The running water is obtained from the Detroit Water Department. The Detroit Edison Company furnishes the electric current that is available in all parts of the section. The Consumer’s Power Company supplies Hazel Park with gas for domestic purposes. It is available throughout the section at present. Until two years ago when the company piped the entire district, people had to use oil or wood stoves for their cooking. The first telephone was installed in Hazel Park during the summer of 1924. The service has been gradually increased since that time, but it was less than six months ago that it was possible for everyone who wanted it, to get a telephone. The school system of Hazel Park is the only thing that makes one think that there is enough common organization so you can call it a community. If it were not for state legislation regarding schools there would not be any cooperation. In fact, a cooperative spirit is not very marked even in school matters. The people support them because the State says they have to. The school controls the center of the stage for both comment and criticism. The latter seems to be most prevalent and the employees of the school sometimes wish there was a city government other than school that the knockers could cuss and discuss. Of course we all make mistakes, even the School Board does, at times. Las fall we were known as the mecca of the dimpled knee school teachers just because the School Board attempted to cloth the lady teachers in smocks that were to be exactly 10” from the floor. It gave the school and the community nation-wide publicity, but I am wondering if it is just that we should have received such publicity because of a mistake of four people. It has caused much ill feeling and disorganization within the four square miles. In June 1924, schools closed with 425 students and had 10 teachers. At the close of school in June 1928, five years later there were 2800 children in school and 112 teachers on the payroll.3 Because of the rapid rate of growth it has been a big task for the School Board and the school administrative employees to keep the children housed and the plans for operating in working condition. Schools closed in June 1928 with 600 pupils in the lower grades on half-day sessions. Is this fair to the boys and girls who are going to be our future citizens? On may 26, the district voted a $500,000.00 bond issue for a new high school, but this will not relieve the congested conditions in the schools next September when there will be at least 400 more enrolled than we closed with in June. Despite all of the problems that we meet and try to solve in the best possible way, the University of Michigan’s and North Central’s accredited lists. The health of the school children is entrusted to the care of three full time nurses and one part time doctor. They examine the children twice each year and recommend the correction that should be made. The school doctor is called for consultation in cases where the nurses need a doctor’s advice. He has the final authority on all cases of importance. The nurses administrate service from the school offices and go into the homes to help in many cases. Because of confidence in the nurses and because of economy, the majority of parents call a physician only in cases of severe sickness. projects in the state of Michigan. A special school bus is used to transport the children to and from school. During the month of March 1928 about 1,100 school children were treated with toxin antitoxin in the school by the township’s Health Officer, the school doctor and the nurse so that they would be immune from the dreaded disease of diphtheria. Approximately the same number treated for the disease the previous year. The Township’s Health Officer does little in the community except in urgent cases and putting up and taking down house placards. The Royal Oak Township Community Council nurse and doctor hold clinics for preschool children in the high school building every other Saturday during the year. Last spring the Parent Teacher Association canvassed the district to secure the names of children who would enter the school for the first time in September. Special clinics are held during the summer for these children and recommendations for correction are made. A dentist comes to the school 2 ½ days each week to take care of the dental needs of the children at minimum cost. We are proud to inform the public that in spite of all of the unhealthy conditions that exist, we have never had an epidemic of any disease. Nearly every spring there are several cases of measles and mumps, but the schools have never been closed on account of disease. Two dentists, three physicians and an eye, ear, nose and throat specialist compose the group of men who take care of the health needs in Hazel Park. One doctor maintains a small local hospital with 15 beds. The death rate is high. This is due to the house congestion, unsanitary conditions and poverty. The Detroit Community Fund extends its work into Royal Oak Township where it is called the Royal Oak Township Branch. The Fund receives donations in the territory, but uses approximately twice as much in Royal Oak Township as is collected within its boundaries. One reason for this is because many of the men live in Royal Oak Township and contribute in Detroit where they work. Another reason is because of the big brother feeling; Visiting Nurses are furnished, clinics are held, charity cases are helped and many other forms of service are maintained by the Council. The Township’s Poor Commission helps in some very extreme cases of poverty but the help from this source is limited. At the Christmas season when everybody would like to be happy and have the spirit of giving, there are always many families who scarcely have enough to eat and clothes to wear. Each year The Goodfellows help bring a little Christmas cheer to the needy families by giving large baskets of food topped with toys for the children. The money to pay for this is obtained by selling newspapers that are donated by the newspaper companies. Firemen, policemen, high school seniors and others help in the campaign. The papers are sold for whatever one wishes to donate to the cause. The clubs, churches and lodges cooperate each year in furnishing a community Christmas tree. The local Exchange Club helps by each member taking a needy family to provide a Christmas for. The club also gives a picnic to the crippled children of the community during the month of August. When work is scarce there are many needy people in the community. Charity organizations do what they can, but do not reach all of the worthy cases. In midwinter you often see boys and girls with only worn out tennis shoes to protect their feet from the snow and ice. Many notes are received at the office from parents who say that their children cannot come to school because of insufficient clothing or shoes to wear and probably they should go further and say because of lack of food. Last year one of the school nurses reported the following incident that she witnessed while visiting a home. It was suppertime and the five, should be, healthy children, were asking for something to eat. Supper was soon ready, the Mother poured part of a box of corn flakes into a wood-bottomed chair and the five children ate. The nurse said that the cupboard doors were open and the shelves were base, as well as on the table. The mother, with tears in her eyes, said there was not another thing in the house to eat, and no money to buy more. A library has been installed in one of the schools and is open to the public five hours each day. The three main churches in Hazel Park are Community, Baptist and Methodist. Other denominations are represented with Sunday schools and church services from time to time. There is one weekly newspaper published in the district called “ The Hazel Park News”. Various other publications edited in Detroit, Royal Oak and Pontiac adequately serve the population.. I have described the conditions as they exist in Hazel Park, having taken all material from facts and figures. I sincerely hope that you have enjoyed reading this description and that I have described conditions well enough so that you can comprehend them as they really exist.